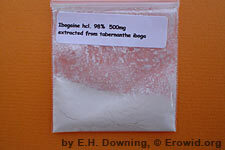 Ibogaine is the active chemical found in the African Tabernanthe iboga root as well as several other plant species. It is a strong, long-lasting psychedelic used traditionally in a coming of age ritual but also known for its modern use in treating opiate addiction. Powerful But Gentle, by C.S. Spectacular, Sacramental Meeting, by Bjorn C.